Mar 22, 2011 • As the world moves toward adding a few more billion people in the coming decades, many people who keep an eye on the horizon find themselves worried about water. Drinking water, water for irrigation, water for industry. Getting clean water is already a major problem for many of the world’s rural impoverished, and it is becoming more of an issue for the world’s major urban cities, which are growing at sometimes astonishing rates. Meanwhile, agriculture remains by far the biggest user of fresh water, and we will only need more agriculture as the population continues to grow. This set of interrelated challenges is both why the U.N. seeks to draw attention to water every year with World Water Day—today—and why NASA puts an intense scientific focus on improving our understanding of the world’s water cycle. Most of us just turn a tap and forget about it, but the ease of that convenience comes from a highly managed system on top of a natural cycle that includes precipitation, groundwater recharge, snowpack melt…and then consumption. NASA tries to understand the fine details of this cycle by measuring changes in snowpack and groundwater, the amount of soil moisture in farm fields and even the amount of water consumed by vegetation. It’s all possible through satellite measurements. A NASA science writer spoke with Bradley Doorn, program manager for Agriculture, Carbon, and Water applications in the Applied Science Program of NASA’s Earth Science Division, on these fundamental concerns about our most precious resource. 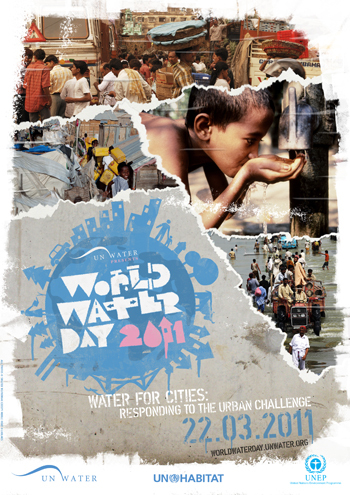 The theme for World Water Day 2011 is Water for Cities: Responding to the Urban Challenge. What water issues do major cities face? Big cities of are one part of a global water cycle that NASA studies. If you step back and look at what NASA does to study the issue of freshwater availability, we’re looking at the origins: What are the Earth’s water supply sources, what are the risks to those sources? You have reservoirs underground, you have snowpack, you have our renewable water supplies from precipitation — and then you have consumptive issues. That’s where big cities fit in. And there you could bracket off a lot of issues they face, from failing infrastructure, greater demands on use, a lack of conservation practices to good water quality and health issues. What does the overall picture of how we use water in this country look like, and what exactly is NASA’s role in studying that? NASA has a key role, which is in trying to understand the supply and demand issues. That’s where it starts. That’s what we focus on. You have these big tradeoffs in how we use what water is available. How much are we going to give agriculture to grow food not only for sustenance but also to grow our economy? How much are you going to give to energy? Where do the consumptive needs of big cities fall into this? You have all these demands on the cycle of water. It might be surprising to some people, but it is more difficult than it seems, because it’s not an easy cycle to monitor. There are a lot of unknowns. How well are we replenishing our aquifers? How fast are snow packs melting? These are global issues that don’t just stop at the borders, and what affects us doesn’t stop at the borders. What are the concerns about climate change and water availability? We’re seeing changes, and there’s no doubt that climate is having an impact. What’s difficult is understanding the extent of the impact. And it is one of many issues. It’s really important that we put it in the equation to better and more accurately assess long- and short-term trends to plan what water we’re going to have in the future. While many of the short-term issues we face are more due to water resource management issues than climate change, solutions must include a better understanding of how climate change is affecting our water cycle. We’re starting to make closer connections between some climate-change issues to more pragmatic, tangible issues with agriculture and water supply. We’re getting there, but it’s going to be a long journey. What kind of climate impacts are you seeing now and how can NASA monitor these ongoing changes? What we’re seeing now, with water from snowpack and groundwater, is larger standard deviations, larger changes from year to year. NASA satellite and modeling capabilities allow us to view or enhance critical water resource parameters to allow more spatial resolution and temporal frequency. The ability to monitor persistently and comprehensively allows us to understand how and why water supply (and is some cases demand) is fluctuating. Who uses the most water in the U.S.? Agriculture, by far. In the West, somewhere near 70 to 90 percent of water use is for agriculture. If you look around the globe, it’s not a trend that’s going down. One of the unique things NASA brings to this game is the thermal infrared on MODIS and Landsat and the ability to assess evapotranspiration, which is essentially a measure of how much water is being used by vegetation. Being more efficient about how much water agriculture is using is good for the farmer and good for the consumer. When you look at the rapid development and agriculture growth in the American west over the past few decades, is that sustainable? Here’s how I would answer that: It’s not sustainable with the current way we make decisions and the current information that we have. And everyone knows that. You won’t go to a water managers’ conference and hear someone say, “we’re fine.” I truly believe solutions will come to opportunities. I see that a major part of my role is to get the information into the hands of the scientists and engineers so they can discover those opportunities and let industry, water resource managers, policy-makers, and the public leverage those opportunities into solutions. This entry is filed under Carbon and Climate, Human Health, News, Water.